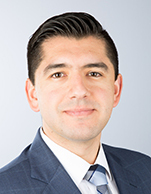 Sebastian Mercado is Deutsche Bank's executive in charge of ETF Research for the Americas region. His work includes implementation of investment strategies, due diligence, asset allocation guidance through ETF flows, and thought leadership. He is also responsible for maintaining a fluid dialogue with clients and industry participants around the world. His work has been quoted in several media outlets such as The Financial Times, The Wall Street Journal, Bloomberg, and CNBC among others. In addition, his team has won several "Best ETF Research" industry awards from ETFExpress.com and exchangetradedfunds.com. He holds a B.S. in industrial engineering from Pontificia Universidad Catolica de Valparaiso in Chile, and the Chartered Financial Analyst designation from CFA Institute.